Beginning Friday, August 18th at 9:00 pm ET, Duskruin will be offering a new way to challenge foes in the arena! TEAM MATCHES! Join up with the bravest adventurers around Elanthia and try out the new three versus three challenges against the arena’s toughest! If you thought the arena was intense before, you’ll be blown away by this next level gauntlet! New BLOODRUNES are also available this run! Two new tiers can be found searching the sewers.ARCANE and MYSTIC BLOODRUNES have a whole new look for your MOONSHARD PENDANTS! Be sure to collect them all! Within the BLOODFORGE are two new areas -- the smelter and smithy! The smelter has a dwarven miner who sells ore that can be smelted into rare forging slabs! The smithy is an all new, invite only, workshop that offers weighting, padding, and sighting for your gear! Earning invites to this exclusive area is done through impressive battles in the arena! This run of Duskruin introduces new achievements for you to unlock! Brand new titles that are earned by completing various feats throughout the event! 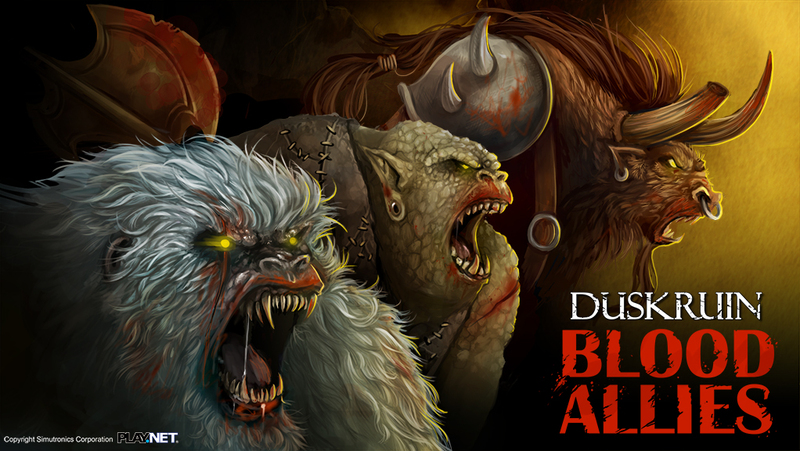 Become the Bloodriven Brute or perhaps the Hero of Duskruin Arena! Progress for these rewards started earlier this year, so be sure to type TITLE in game to check your status after the event kicks off! Bloodriven Village is also seeing some additional new shops with brand new inventories! Unlock certificates for a wide selection of items! The High End Scrip Shop also has new wares! And this is just SOME of the items available! The battle begins on Friday, August 18th at 9:00 pm ET and will continue through Thursday, August 31st at 11:59pm ET to give you plenty of time to shop and enjoy all the new features at Duskruin Arena!